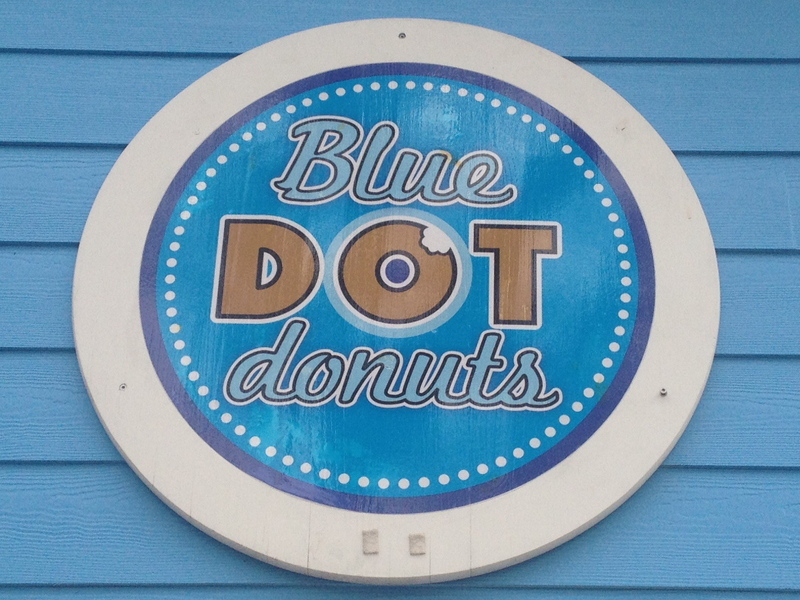 The clever logo only adds to the appeal of Blue Dot Donuts. Before reading this post, you might want to go ahead and invest in a pair of pants with an elastic waistband. If you’re anything like me, you will go nuts for these donuts. After all, sometimes there is nothing more satisfying than fried dough smothered in icing and filled with fruit or Bavarian cream. While companies like Krispy Kreme and Dunkin’ Donuts revolutionized the industry, a little place on Canal Street helped to rejuvenate a city. As New Orleans continues to grow and rebuild itself post-Katrina, it is easy to recognize that the small, local businesses are the backbone of this town. I could not even tell you if there is a Krispy Kreme or Dunkin’ Donuts in New Orleans. Even if I lived next door to one of these national franchises, I would much rather make the drive to Mid City and pick up a dozen from Blue Dot Donuts. Now, try to keep a straight face as I pass along one of the most important pieces of information about this local business: it was started by three New Orleans police officers. I know what you are thinking: “Cops and donuts? She can’t be serious!” Oh, but I am. And while it might seem incredibly stereotypical, I would be willing to take the stand and testify that these cops know their donuts. Dennis Gibliant, Ronald Laporte and Brandon Singleton are the founders of this incredible calorie-packed shop that opened in April of 2011. The pairing of cops and donuts seems as though it would be an ingenious marketing scheme, but despite the shop’s popularity, there do not appear to be any plans to turn it into a franchise. That in itself can make you appreciate it as a true New Orleans gem. The website boasts that the shop serves 40-50 flavors of donuts daily. My pick goes to the classic buttermilk. This donut is heavenly. It has a slight crunch on the outside, and once you break through that, you’re greeted with the most gloriously dense, moist donut I have ever tasted. It’s plain. It’s simple. But its execution is impeccable. The fruit glazed donuts are almost equally as satisfying. I have tried the strawberry, blueberry, and orange glazed varieties. These are certainly a completely different sort of donut than the buttermilk. They are light and fluffy, with just the right hint of fruity flavor in the icing to compliment the donut. Feeling slightly more exotic? Hugely popular amongst men is the Maple Bacon Long John. While the donut is still sweet, it maintains a distinctive taste of bacon. Perhaps that element makes the men feel more manly. Of course, the shop can take simple donuts and turn them into extravagant creations. Anyone up for a Glazed Donut Bread Pudding with White Chocolate Sauce? Or perhaps Red Velvet pleases your fancy. If you can dream it up, I imagine this place could create it. The fact that Blue Dot Donuts is only a few blocks from my job is simultaneously convenient and dangerous. The biggest danger is in the price. These donuts are cheap! With non-specialty donuts priced at just 75 cents a pop, you will find yourself making excuses as to why you should buy “just a few more” each time you go. My advice is to pick up a dozen, eat one (or two) and resolve to leave the rest by the coffee at work (you will make friends quickly this way if you are just starting a new job). A plus: when I do stop here before work, I never have to wait very long. If there is a line, it usually moves quickly, but typically there are never more than a handful of people there at a time. Even if you happen to visit at a busy time, consider waiting it out. These donuts are that good. Blue Dot opens early, but that means they close early as well. Monday through Friday’s hours are 6:00 a.m. until 4:00 p.m. Saturday and Sunday’s hours are 6:00 a.m. until 3:00 p.m. 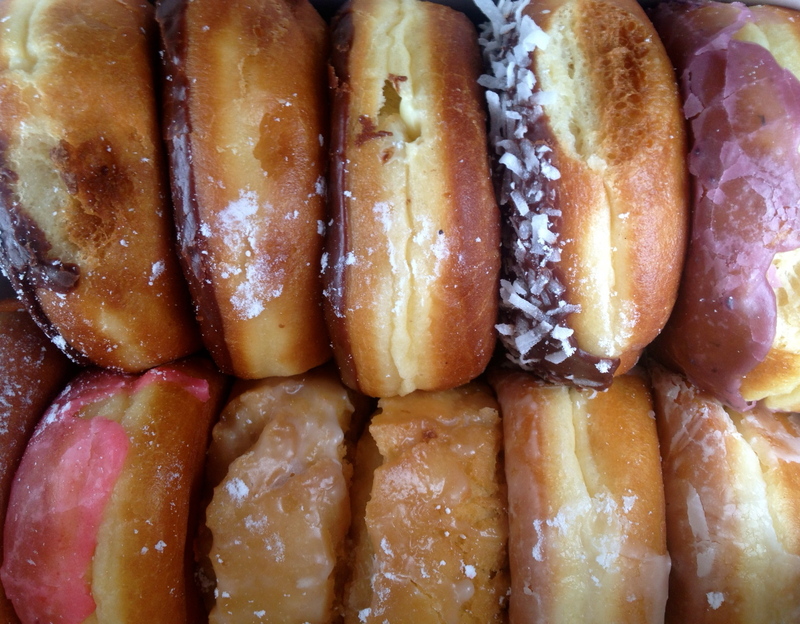 If you only plan on ordering one or two donuts, bring cash. The bakery has a minimum purchase amount in order to use a credit card. (Really, you should just buy a dozen donuts and you’ll avoid the issue altogether). Visit the website http://www.BlueDotDonuts.com to access the full menu and find out more information.